For startups, the range of funding options is overwhelming. Do you crowdfund or get a business loan? Incubate or accelerate? You know you need capital to grow your business, but have a limited amount of time and energy -- you want to make sure to choose the funding option that gives you access to the best connections and opportunities, but aren’t sure where to start. Most startups dream of being accepted into a world-class mentorship program and the chance to pitch big-name investors, but don’t know the difference between two of the primary funding options that provide these opportunities: accelerators and incubators. Often used interchangeably, accelerators and incubators actually serve different purposes, have different outcomes, and accept different kinds of startups. Knowing the difference helps you focus the search for funding in the right areas, and improves your chances of success. By the end, you’ll know the differences between these two important funding sources and be able to determine which is right for your business. In this section, we’ll look at the key components of an accelerator program, application process, program duration, investment capital, and main benefits compared to an incubator program. A startup accelerator is an organization that offers mentorship, capital, and connections to investors and business partners. It’s designed for select startups with promising MVPs and founders, as a way to rapidly scale growth. Is an accelerator program right for your startup? Accelerators are for startups that already have an MVP that has been validated in some way -- that might mean a product with a few paying customers, a group of free users, or early signs of strong product-market fit. The acceptance rate for accelerators is low since thousands of startups apply for the programs and there’s a limited amount of capital, physical space, and mentorship time available. Accelerators often take a cut of equity in exchange for program placement. 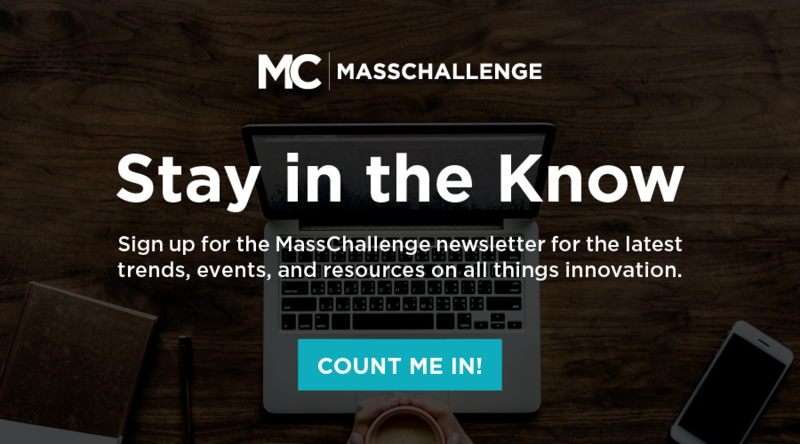 Note: MassChallenge perates on a 0% equity model and award $3,000,000 in prizes to participating startups globally. Apply now for the next program near you. Solo founders with unvalidated ideas are a better fit for incubators than accelerators, because incubators work to help formulate a business model and team over a longer period of time. Accelerators are right for startups that are ready to scale, not startups engaged in customer development and trying to find product-market fit. Accelerators are intense and fast-paced, taking 3-6 months to get an early-stage startup ready for market. 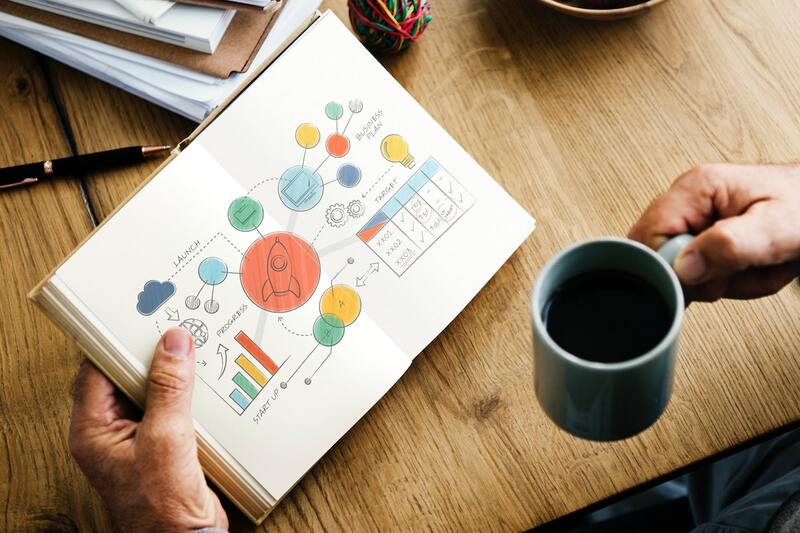 Typically, startups have done a lot of the legwork to prove their product before going into an accelerator program; startups should be able to attract investors after just a few months of mentorship and growth. Application. An application will ask for specifics on a startup’s idea, market, traction, team, and other aspects vital to success. Assessment. Promising teams from the pre-screening phase move on to be assessed for investability, revenue potential, and overall strength of the product/service offering. Interview. At this stage the accelerator is very interested, but wants to know about the team, product and evidence of traction. 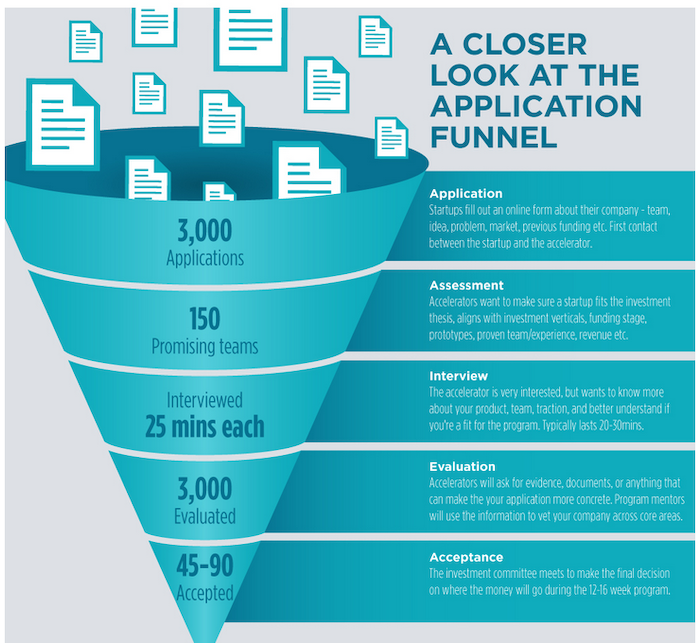 The interview process typically takes 20-30 minutes. Evaluation. Interviewees provide documents to prove their statements about revenue, legal standing, or any claims made about the company. Acceptance. Upon completion of the final evaluations, the investment committee will meet to finalize where the funding will go during the 12-16 week program. Roughly 30-60% of the teams that made it to Assessment phase will receive funding. Tip: Throughout the application process, write concise answers that leave room for future conversations. Create interest in your proposal but don’t try to answer every possible question. Make it easy to access critical business information with links to slide decks, LinkedIn profiles, videos, references, and anything else you think would help investors realize the potential of your startup. Capital is a big part of why startups seek out accelerators. There’s only so far expert guidance and an extended network will take you; sometimes cash is an absolute necessity to support a growing team and product. This is one of the things that differentiates MassChallenge from most other programs - we take 0% equity and award a total of $3,000,000 split between participants in a program. 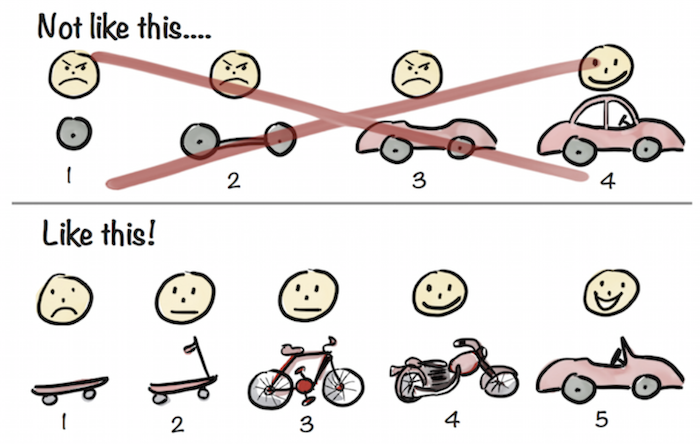 Do you have a prototype or MVP? According to Franco Iovi Vollbrecht, who reviews applications for Start-Up Chile, almost all accelerators will require a Minimum Viable Product from startups they consider. Since they’re looking for high-growth potential companies who have a likelihood of becoming successful in just a few short months, accelerator programs need to see more than a concept. An MVP is what it sounds like: the leanest version of a product or service that actually works and demonstrates its use case. Eric Ries, defined an MVP as that version of a new product which allows a team to collect the maximum amount of validated learning about customers with the least effort. 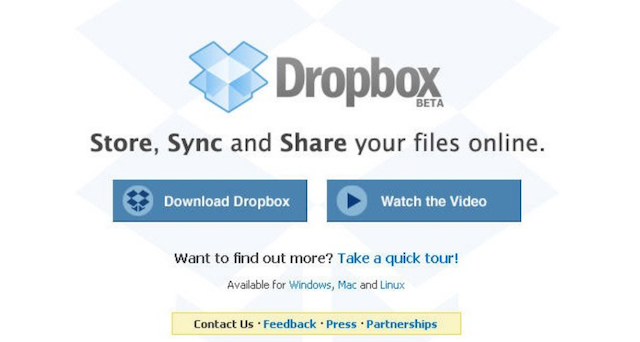 The Dropbox MVP didn’t have comments, collaborative document editing, or enterprise-grade admin control. It was a way to put a file on the internet and retrieve it later. That’s the kind of thinking you should apply when creating or evaluating your own MVP -- does it do one well enough to deliver value to customers? Note: Startup teams often make the mistake of over emphasizing the minimum part of MVP at the expense of the viable part. i.e the product delivered is not quality enough to provide an accurate indication of whether or not a customer will actually use the product. Is it fit for its target user? Does it offer the user value (saving time, money)? Does it solve the problem you promised to solve? Does it give the user a good idea of what the final version will look and feel like? One-of-a-kind networking opportunities. Get access to opportunities with well-established companies and influencers. Personalized guidance from serial founders and investors. Accelerators work with angels, VCs, and seasoned founders -- they may even end up investing in accelerated startups at the program’s end. Collaboration and partnerships with innovative startups. Most startups are facing similar customer acquisition or team management issues -- accelerators give you a chance to learn how to overcome early challenges together. Around 38% of accelerated startups raise Series A, making accelerated startups almost 50% more likely to raise a seed round than those who didn’t participate in a program. Who are accelerators looking for? If your startup is in a situation where it has a validated MVP and strong founding team but not enough capital to scale and get significant traction, your startup could be a good fit for an accelerator program. An accelerator isn’t likely to take an application seriously that has no proof-of-concept or is being run by a solo founder without a business model. Incubators are more open-ended than accelerators, and aren't usually designed to rapidly boost growth. Instead, incubators nurture and mentor startups over longer periods of time - over a year. While accelerators want to pay close attention to each startup, incubators provide ad-hoc help with legal and business services, as well as help turning a concept into something with product-market fit. Incubators usually provide office space and consultations with experts, but take a more laid-back approach. There’s no intense program here -- just an environment of collaboration and support when needed. Examples of incubators include 500 Startups and Amplify.LA. If your company is not ready to join an accelerator program, an incubator might be the answer. Incubators help startups solve technical and design issues when building the product, learn how to run lean, and build a successful team. Incubators also help startups who don’t have experience operating a venture-backed startup or are up against legal and operational issues related to company structure, etc. Incubators usually don’t require equity or put as much pressure on success as accelerators, but also don’t offer capital. It’s all a trade-off. Incubators can run anywhere from 6 months to 5 years, which gives teams a lot more time to grapple with the problem their business is solving (albeit usually in a lower-touch environment). The application process for incubators is not as competitive as accelerators. They often focus on advancing local startups and improving the area’s business ecosystem. This often means including businesses that aren’t showing signs of rapid growth or scalability. Incubators are less rigid with applications than accelerators, so the process is harder to generalize; check the FAQs of incubators in your local area for specifics. Incubators don’t traditionally offer capital to startups, instead offering office space, mentorship and partner opportunities. Because no capital is given, incubators don’t ask for a cut of equity. Who are Incubators looking for? Incubators and accelerators both look for promising companies, but incubators are more lenient. A robust MVP and business plan usually isn’t a “must-have”, but a great idea is. The same goes for a company’s growth potential. Since incubators are longer-term arrangements, there’s more room for learning and growth as the program goes on, so incubators are more forgiving towards companies that haven’t achieved product-market fit or got their first 10 customers. 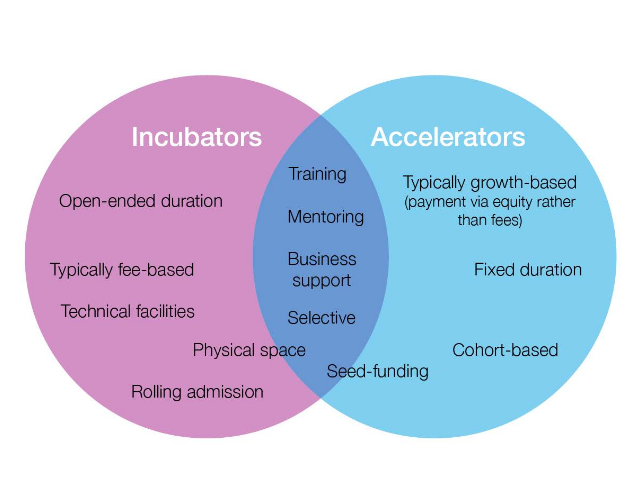 Accelerator or incubator: how do you choose? The choice depends on two main things: (1) what you’re looking for, and (2) the stage of your company. If you’re a proven startup in need of a cash injection to fuel growth, an accelerator is the best option. Earlier-stage companies, or solo first-time founders, are better off with the guidance of an incubator. MassChallenge has grown over the past decade to include six early-stage and two vertical accelerators across five continents. Almost 2,000 startups funded by MassChallenge have raised a total of $4.3b and generated total revenue upwards of $2.5b. The number and quality of investments made puts MassChallenge firmly in the top 10 US accelerators. 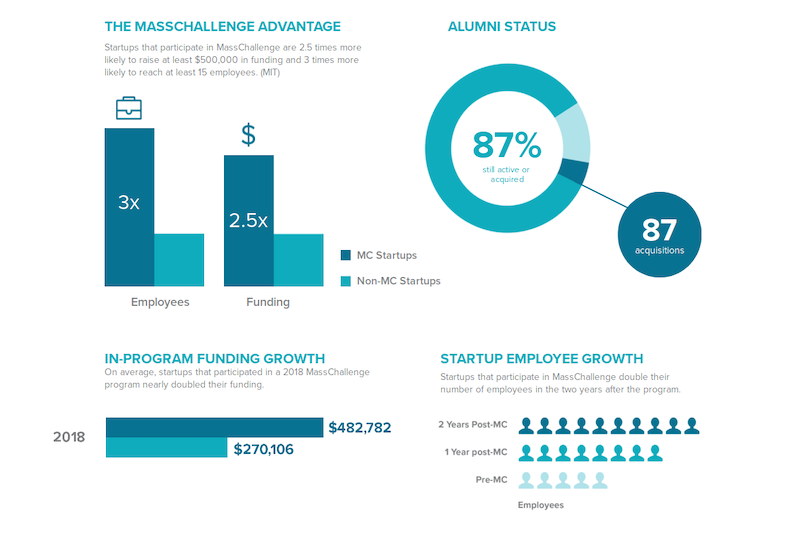 Unlike almost every other acellerator out there, MassChallenge takes 0% equity from startups that go through its program. It’s not uncommon for an accelerator to take ownership of 10% of the company post-graduation, so MassChallenge startups are better-positioned than most to sell equity to investors and use it to attract top talent.